Boyd Welding LLC is located in Ocala Florida. Welcome to Boyd Welding. We are North America’s premier aluminum fuel tank manufacturer located in Ocala, FL. We specialize in Custom fuel tanks and small to medium quantity production runs. 100% of our tanks are manufactured packaged and shipped from our Florida facility to locations all over the world. 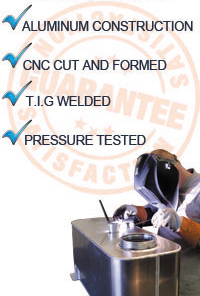 Our strict focus on Safety, Accuracy, Quality Welding, Excellent Appearance and Short Production Times have provided us the opportunities to continue working with some of the best car builders and biggest OEM companies. From the custom car builder to large corporate contracts we handle everything fuel tank related. Our expanded parts line has empowered our DIY customers an opportunity to shop online with same day shipping available to get your project finished on time. Since our business revolves around building custom tanks to your design specifications we do not have the ability to cross reference or predict what shape may or may not fit your specific vehicle. However, I invite you to browse our Universal Tank, Transfer Tank or Replacement Tank sections that may offer a “quick fix” solution to your project. You will also find we have provided an extensive Parts section to assist you in choosing the components you would like us to use in the fabrication of your tank. If you’re interested in a custom tank simply submit a drawing following our guidelines here. Once your design is complete and you are ready for a Quote you can submit your design to us Via Email, Fax or mail. Under most circumstances you will receive an estimate within a few hours. Request for quotes received over the weekend or holidays will be reviewed on the next business day. Our motto is simple, “Build the best tank at a fair price”. We accomplish this daily by paying attention to the details. Each of our tanks are built from prime scratch free aluminum sheets, T.I.G welded by hand and handled with care through every process ensuring a scratch free finish. Each and every tank is hydro pressure tested to 5 PSI to ensure a leak free tank backed by our 2 year structural warranty.